"Right from start of the class I noticed Dr. Jason Kirby's inquisitiveness to learn more about the business of health care and how it works. His questions ranged from how economic theories can be applied to the field to health care policy-making fundamentals. During class discussions, he not only provided valuable and practical input, but listened to fellow classmates' points of view, creating a participatory intelligent discussion. After he earned his MBA degree, we offered him a part-time teaching position in the Master of Science in health care administration and management program based on his clinical knowledge of the health care sector." "I made the decision to apply for the fall 2015 MBA cohort and it turned out to be one of the best decisions of my life. The curriculum was immensely interesting, complex and challenging. The faculty really wanted me to succeed and dedicated a lot of time when necessary to ensure my understanding of the material." 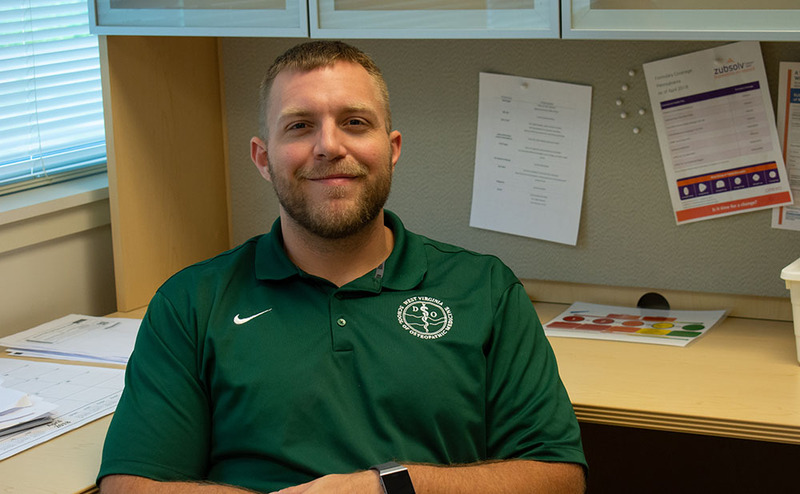 Kirby is also a part-time assistant professor in Point Park University's Master of Science in health care administration and management program. As a doctor, why did you decide to pursue an MBA degree? In medical school, I learned the amazing mechanism of the human body in both its normal physiologic states and disease states. I could not be happier with the medical training that I received. I learned medicine from one of the best institutions in the country. However, in today’s changing health care environment, a great deal of non-medical knowledge and skills are becoming more and more relevant, valuable and necessary to navigate our complex health care environment. I love being a physician and improving the lives of my patients, but I felt a higher calling to help affect the care of populations in a variety of settings. Health care administrators and managed care companies spoke in a language I did not understand. I wanted to speak that language as well and act as a translator in a sense to my physician and operational colleagues. I knew I needed additional skills and training in economics, organizational behaviors and management/leadership to be effective in a higher-level role. I needed to go back to school to pursue an MBA degree somewhere. This decision was anxiety provoking because I had never taken a business course in my academic career. I wasn’t sure I could keep up. My wife’s cousin, Ben Eonta, who is also a graduate of Point Park's MBA program, highly suggested I research to see if Point Park’s program was right for my career aspirations. Ben loved the faculty and the program, and it helped him get to a career he wanted. What factors made you select Point Park University? Point Park University offered a flexible evening schedule, did not require the GMAT (which was a very big consideration for me) and the faculty were real-world business leaders, not just academic researchers like in other institutions. The tuition was affordable and the campus is really exquisite and safe. I made the decision to apply for the fall 2015 MBA cohort and it turned out to be one of the best decisions of my life. The curriculum was immensely interesting to me, complex and challenging. The faculty really wanted me to succeed and dedicated a lot of time when necessary to ensure my understanding of the material. How have your MBA classes helped you in the health care work you do? I took the core classes required by the program including Organizational Behavior, Global Environment of Business, Accounting for Managers and Managerial Economics, which provided me with a solid foundation of business topics and theory to build from. Since I chose the health systems management concentration, I also took health care centric classes such as Health Care Economics, Health Policy and Financial Analysis of Health Care, which I found immensely valuable to my transition to an administrator and manager in my current roles. What have you enjoyed most about returning to Point Park, now as a faculty member? I was certainly humbled and surprised when asked by Dr. Maharaja to become a part-time assistant professor in the Master of Science in health care administration and management program. I had never considered teaching as something I’d pursue, but I wanted to give it a shot to see how it went. I built two classes in the program which I am currently teaching every semester: Health Care Policy Analysis and Health Care Quality Improvement and Evidence-Based Medicine. I really enjoy sharing my expertise in both administration and clinical skills with my students. I am proud to be able to give something back to Point Park and the Pittsburgh community, and to continue to be a part of the University. That quote really continues to speak to me because it is absolutely true. If you want something more than what you have, keep reaching and go get it. It’s doable to change your career and life in a direction you want at any age or point as long as you’re willing and ready to work for the results. Don’t just dream ... DO.